Get the best performance out of your balls in the big matches and on the training pitch by ensuring they're pumped up to the perfect level with this Mitre Pressure Gauge Ball Pump. This ball pump pressure gauge can be used to test the pressure level, up to a maximum of 15 psi, of both match and training rugby balls, letting you know exactly how much they need to be pumped up for peak performance. 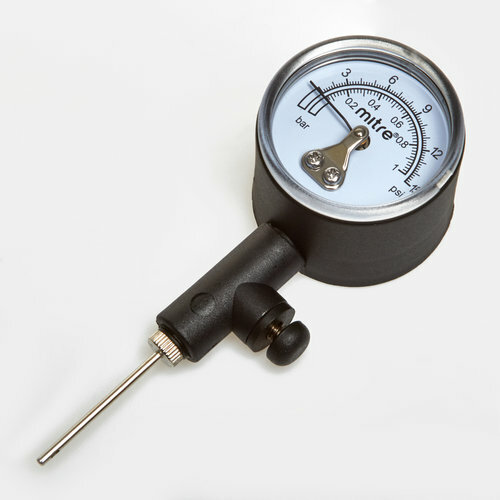 The gauge is used by moistening the needle and inserting into the ball's valve. For match balls, between 9-12 psi is recommended, and for training balls, 7 psi. Ensure your balls are match ready by checking they're at their best with this Mitre Pressure Gauge Ball Pump.